Yafray supports Global Illumination*. 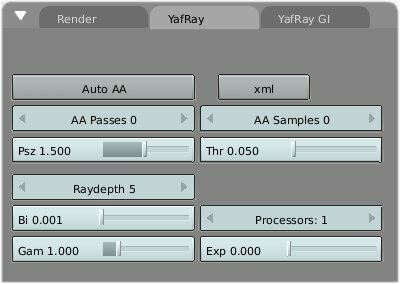 We have to go back to the ‘Render’ tab to learn more about Yafray’s implementation of GI. The first look at the ‘Yafray GI’ tab and you might think. oh! its so easy, you are right the features available are simplified for your use. The available options are ‘Method’ and ‘Quality’, let’s have a look at them one by one. The quality is same for both and is explained later. The available ‘Methods’ of GI. Skydome – While Skydome is simply a method to have lighting from the sky or more appropriately the atmosphere, it does not provides full GI in the true scenes as it does not take into account the indirect light bounces on the surfaces of objects rather it affects the light in the scene by the colour of the atmosphere and also the diffusion of light in the atmosphere is controlled by it. For eg in the default scene, the colour of atmosphere was set at reddish (chosen just to clearly identify the effect). See Image19 for how the diffusion affects the scene. Image19. The left part of the image have the power of diffusion set at 2 while the right one at 4. The colour of the background or atmosphere can be changed in the ‘Word’ Panel (F8). You have to enable the world for Skydome to work fully. The Skydome offers no other features. The Skydome is a faster method of GI, while its results may not be physically more accurate, but its results are not to bad to ignore for the speed advantage it offers. Full – On the other hand the Full option takes into consideration the reflected and/or refracted light bounces (or indirect light) on neighboring surfaces. This method is a very close simulation of actual lightning in the real world, and that’s why the GI produces more photo-realistic images than any other method used in CG, also that’s why it requires higher computations and is slower. Image20. Using Full GI increases the time as well as realism. 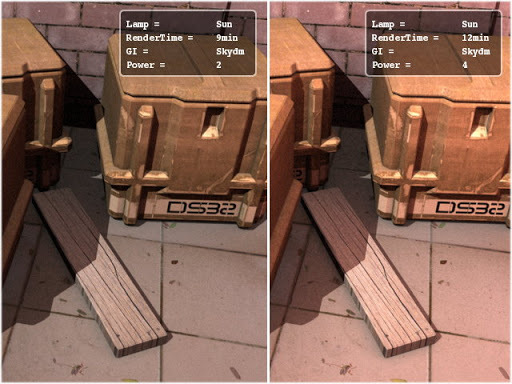 Notice the difference in realism between the two parts in Image20.The light bounces provide enough diffusion in the second part of the image, which lits up the shadow portion in the scene according to the distance of the surfaces in contact. While the first part have approximately similar shadow depth throughout. Image21. The Yafray GI tab. Options for the full method are visible. Depth: This refers to the total number of light bounces for one reflected or diffuse ray. Generally the depth 3 works best for normal scenes. Increasing the depth results in higher ammount of calculation per ray. Cdepth: The Cdepth is nothing but the bounce depth for caustics, or for the transparent materials like the glass, gems, liquids etc. Higher computations are required for caustics calculations, that is why the GI in CG keeps separating the normal lights with photons, even though in the real world the photons are the actual light particles. For better quality of caustics you will need to have as much as 3-5 Cdepth or more for detail. Photon: This photon button should not be confused with the photon lamp. 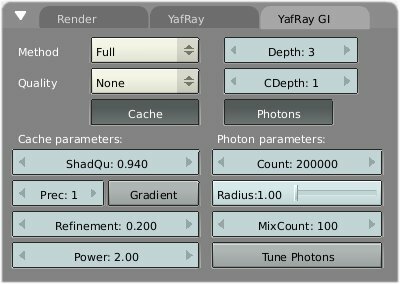 This is only used as a helper in global illumination for Yafray and bears no relation with the caustic photon lamps or caustic photons. Count: The count refers to the total number of photons to be made available in the scene for helper in GI. The number of photons will vary for the scene, but the higher numbers in the scene will provide smoother results, again it’s at your disposal to find time/quality limit. Radius: This refers to the distance within which the photons calculated have higher precision value to effect the GI, outside which the photons do not affect the scene much. So the Idea is to optimize the radius to the size of the area where better GI calculation is required. Keep the radius half the size of the area. MixCount: This allows you to choose the number of photons which should be kept inside the Radius. The ‘Radius’ and ‘Mix Count’ make up your ‘photon map’. The photon map is nothing but the optimized area for photons used in GI calculation and Yafray sufficiently process the sampling and photon gathering on the photons inside the photon map and leaves the photons outside the photon map. Tune Photons: This allows the re-use of a successful gathering of photons and positions from the cache, which helped in GI calculation on the previous render, and only recompute the other photons for faster result. It is may not necessarily faster in every rendering but can provide good speed improvements generally. Due to speed improvement it is good to use it during test renders once you come close to what you wanted. You can disable it after, you are satisfied with the test renders and want to create a final version of the image to do the full computation again. Quality: The quality drop-down list allows you to choose the quality level of GI for both the Skydome and Full GI methods. The quality setting allows control over the number of samples used to sample in GI. Since its use is automatic by default, it will try to use maximum value for MultiPasses and samples per pass depending upon the quality level. If you want you can disable the AutomaticAA manually and can instruct Yafray accordingly. Anti-Aliasing: The ‘Yafray’ tab in ‘Rendering options’ window lists the options for manual control over anti-aliasing. Press the AutoAA button to un-hide the manual settings. AAPasses: It is used for the number of passes to be used for Anti-Aliasing. The higher the passes, better the results, longer render times also. While using passes more than one, every pass samples the total no of samples chosen in ‘AASamples’ for every pass, thereby achieving better AA of pixels in noisier areas. If the results are noisier in the single pass you can increase the no of passes for better control and also a higher number of samples per pass. Single pass anti-aliasing with higher sampling is not necessarily better than lesser samples with multipass. AA Samples: The no of samples per pass. The total AA sampling can be calculated by multiplying AApases with AAsamples. In our case for the final blurred image for the DoF used below, we have used 4×4=16 anti-aliasing samples. Psz: The psz is the Pixel filter size, that is used during the Aliasing calculations for aliasing the overlapping of neighbouring pixels. Threshold: This sets the threshold or the maximum brightness difference with the neighboring pixel when this is above the chosen level, extra samples are taken until the result is below the threshold limit or maximum samples/passes are reached. A Lower threshold means more pixels will be antialiased, so at 0 all pixels in the render will be anti-aliased, when 1 no anti-aliasing is done. Raydepth: This affects the maximum number of ‘bounces’ a reflected/refracted ray can make. This is only important for glass and mirrors, higher ray depth will improve the quality of the reflection/refraction in the glasses and or mirror. The Depth of filter. Yafray supports the real camera like DoF. The DoF of filter setting can be accessed easily. First select camera in viewport then press F9. You will see a tab along with the Camera tab named Yafray DoF. In the Camera, tab enable ‘Show limits’, doing this will allow you to see a yellow cross on the ‘show limit’ line of the camera in viewport. The yellow cross is what we need to put at or near the objects we want to have a sharp focus on. That distance can be set by the ‘DoFDist’ numeric button. The Aperture setting is the value you need to change to get the required DoF you want. Normally the setting in between .100 to .500 will suffice for most scenes. Image23. Notice the noise on the wooden boards. How to remove the artifacts in DoF rendered scenes. DoF filter requires more samplings per scene to get the right amount of blurring. 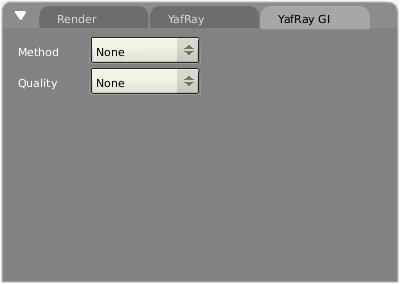 To do that you need to disable Automatic AA in Yafray tab in Render panel. Here try to adjust the AAPasses and AA Sample accordingly. If you have large aperture settings then you need to have Multiple passes plus higher samplings per pass. 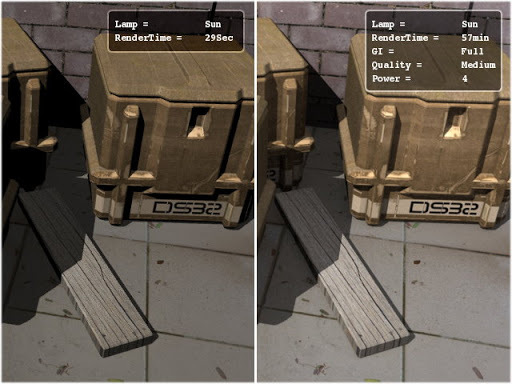 Increasing anti-aliasing will also increase the render times. Image24. Increasing the sampling manually, and aperture size solves the problem. HDRI or High Dynamic Range Illumination. Yafray has HDRI support. To use this go to Word buttons F8. Goto ‘Texture and Input’ tab add a new texture. Then go to texture selection F6 select ‘Texture type as image, press ‘Load image’ button locate the HDR file, select and press Enter. Blender will not show the HDRI image in the word tab, however, it is loaded automatically during rendering. You can also increase or reduce the exposure of the HDRI from the ‘Texture brighteners’ button in the ‘colour tab’ in texture window(F6). The possible exposure settings are -1,0,1, for brightness’ sliders at 0,1,2 this is so because HDRI exposure can be modified in integer values only. For the final step use any one of the GI methods. Generally Skydome will work fine. Image25. HDRI render using Uffizi probe. it need more quality level. That wraps up the unofficial guide to Yafray. I would like to thanks eeshlo, to a large extent I was motivated to learn about Yafray because of him, and thus was able to write this tutorial, and also for his help in solving my queries. Thanks also goes to Dreamsgate for helping in the editing and support for this document. This tutorials is not finished, as there are several aspect which I have not tried myself like caustics, and GI techniques for certain types of renderings. So I call this tutorial at version 1. Later improvements will not necessarily come at regular intervals. If you have any queries or have some point that I overlooked or misunderstood in the matter written above. I would be glad to hear from you. Also welcome are the suggestions for improvements. Global Illumination: It is a method( algorithm) of computation for light calculation in the scene which, takes into account the light bounces from the neighboring surfaces, along with the normal illumination of direct lights. In Other words GI calculates the Indirect light also, thus it makes the renders more photo-realistic. 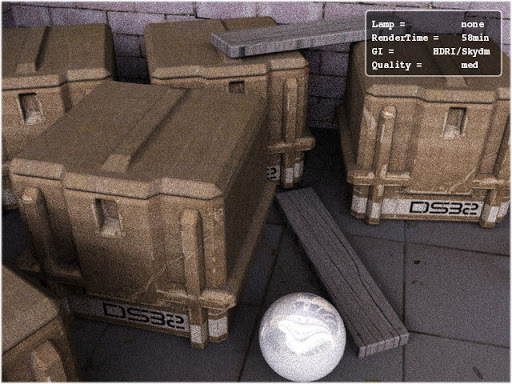 Examples of GI methods are Radiosity and Ambient Occlusion in Blender and on general scale Radiosity, Raytracing and Caustics all use different GI algorithms. Ray tracing: A method in CG which uses an algorithm to calculate the effect of lights on the surface of objects in the scene. 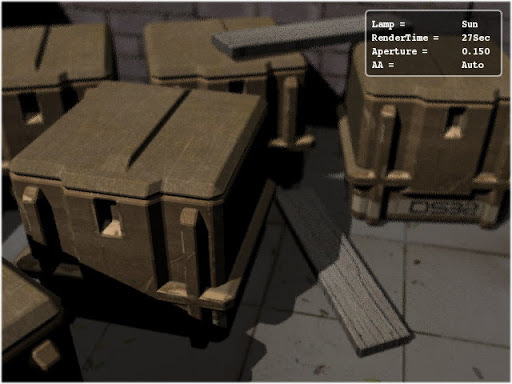 In CG the ray-tracer. works by calculating the light effect on the scene by ‘tracing’ the light photons back to the point of origin, from the scene or the camera. It uses the reverse of What is in real life, the sun shoots photons and we receive them thought reflection refraction from the objects, that photon energy is also modified by the objects by absorption or adsorption to form a particular texture or colour of the object. The reverse way of ray-tracing is done so as to reduce the number of calculations, as it is faster to take just the photons or lights which reach the scene or our eye or the camera, than calculating everything that is outside the view. Photon: The photon is also referred as Ray of light. And it is the smallest unit of light energy. Caustics: The caustics are referred to as the refraction pattern formed by highly transparent objects such as a glass of fluids which have certain degree of Total internal reflection, for example, the light falling on a glass filled with win will form some strange patterns of different colours and intensity which are referred to as light caustic. The computer method for Caustic calculation is also referred to as photon mapping. The photon lamp in Blender/Yafray is for this purpose only. HDRI: Or High Dynamic Range Illumination. This method if is relatively new in GI. This uses the actual light probe value of real a scene in the real world through special equipments to take a 360 view of a scene, and stores the information of the light from all areas in the scene in a spherically mapped image called HDR. The renderer uses that information to shoot light from and provides even more photo-realistic rendering. Anti-aliasing: It refers to a method to reduce the brightness levels between two neighboring pixels by overlapping the colours in the difference level to neighboring pixels. This makes the images appear smoother. Photon map: An assumed area or bound with-in which more density of photons is kept for calculations of indirect illumination.